The brass plaque commemorates Lt. Alasdair Farquhar, RN, who died in the service of his country on 17th June 1916 when in command of HMS Eden. We think the window in the north of the chancel is dedicated to him but it is too high to contain his plaque - so, instead it is in the rear window embrasure on the North Side. HMS Eden was a River Class Destroyer built 1902-4. On 17th June 1916 she was escorting the French troop carrier, H.M.T. 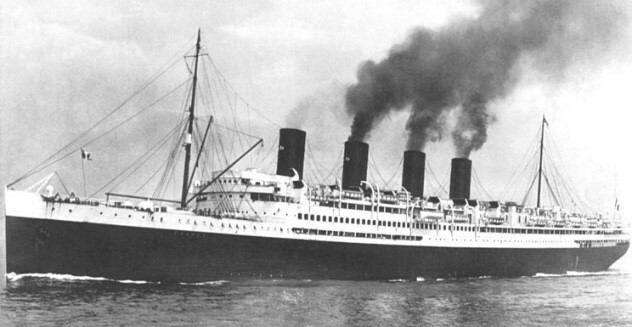 France (a former trans-Atlantic ocean liner), across the English Channel to Le Havre. The France’s steering gear failed, the vessels collided and Eden was cut in two by the much larger ship. Eden's forward half sank immediately but her after half remained afloat and was towed into Le Havre. 42 crewmen lost their lives as a result of the collision. Consider the window above this plaque. ​“Immediately after the feeding of the five thousand Jesus made the disciples get into a boat and go on to the other side of the Sea of Gallilee, while he dismissed the crowd. Afterwards Jesus went alone up on a mountainside to pray. Later that night the boat, already some distance from land, was buffeted by the waves because of a contrary wind. The photos are of a River Class Destroyer and of HMT France in her former glory as a passenger liner.